Jim concentrates his practice on taxation and corporate law. His ability to assist corporations, partnerships, estates, trusts and individuals with tax and financial issues is enhanced by his standing as a certified public accountant (CPA). 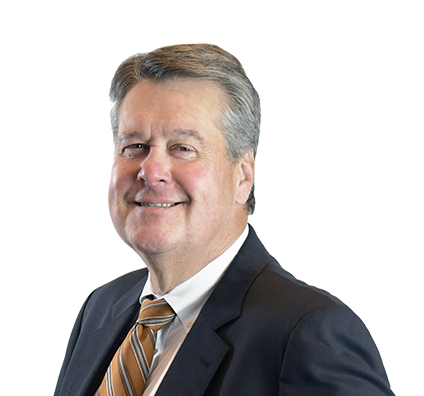 Jim’s corporate practice is focused on representing corporations in mergers and acquisitions, including a variety of transactions involving purchases or sales of domestic and international business operations. He advises closely held corporations on the unique problems they face, including business transfers, recapitalizations, refinancings, shareholder agreements, employment agreements and other contractual matters. The taxation side of Jim’s practice involves negotiating on behalf of clients and advising them on the tax planning aspects of corporate reorganizations and divestitures, including structuring transactions from a tax-effective standpoint. He also represents clients in tax audits and tax appeals at the federal and state levels. Led transaction team on the sale of an agriculture machine manufacturing company with worldwide sales to a more broadly based multinational competitor. Represented 50 percent shareholder in the negotiation and subsequent purchase of other 50 percent shareholder’s interests in moving and storage companies. Negotiated a manufacturing and supply contract with a joint venture partner in India. Advised and counseled a service provider in a tax and structuring investigation that ultimately led to a no charge decision by the government. Negotiated a part sale and part contribution of real estate and farm operations to a public REIT. Represented a physician group on the sale of a multilocation practice to a private equity-backed purchaser. Represented a supermarket chain on a tax audit appeal and post-appeal mediation with the IRS.